You can send a message to one or more people, or to a group email address, and show or hide their email addresses. If you have multiple email addresses, you can choose which address to send your messages from and even an address for receiving replies. In the Mail app on your Mac, type names or email addresses into an address field (such as To or Cc) of your message. As you type, Mail shows addresses that you previously used in Mail or that it finds in the Contacts app. If you’re connected to network servers—say at work or school—it also shows addresses found on those servers. You can also click an address field, then click the Add button that appears. Click a contact in the list, then click the email address. If you use groups in the Contacts app—say for a book club or cycling team—you can send messages to your groups. 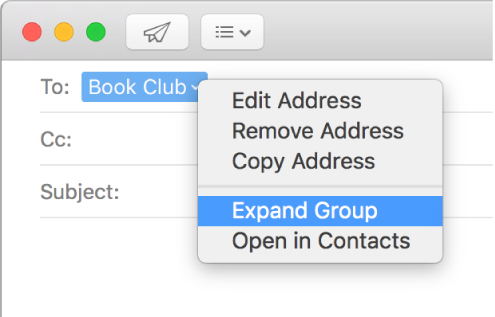 In the Mail app on your Mac, type a group name in an address field (such as To or Cc) of your message. If you see individual contacts instead of the group, you need to change a setting in Mail preferences. Choose Mail > Preferences, click Composing, then deselect “When sending to a group, show all member addresses.” Now enter the group name again. If you decide you want to use individual contacts instead of the group—maybe you want to omit a few people—click the arrow next to the group name, then choose Expand Group. Tip: If someone in a group has multiple email addresses, you can choose which one to always use when you email the group. See Change addresses for contacts in a group. You can send a message so that recipients don’t see each other’s email addresses, to help protect their privacy. In the Mail app on your Mac, type your recipients’ addresses in the Bcc (Blind carbon copy) field in your message. You can leave the To field blank. People receiving your message see “Undisclosed-recipients” in the To field. If you don’t see the Bcc field in your message, click the Header Fields button in the toolbar of the message window, then choose Bcc Address Field. If you set up email aliases or use several email accounts, you can choose which address to use when you send your messages. In the Mail app on your Mac, move the pointer over the From field in your message. Click the pop-up menu that appears, then choose an email address. If you want to use the same From address for all your messages, choose Mail > Preferences, click Composing, click the “Send new messages from” pop-up menu, then choose an email account. Or choose instead to have Mail automatically select the best address, based on the email address of the first recipient in your message, as well as the currently selected mailbox and message. You can specify the address where you want to receive replies to your message. In the Mail app on your Mac, click the Header Fields button in the toolbar of the message window. Choose Reply-To Address Field, then enter the address where you want to receive replies to your message. You can drag addresses between address fields and messages. Some mail servers won’t send a message if even just one address is incorrect. Try to remove or correct invalid addresses, then send the message again. You can import email addresses from other email apps into the Contacts app, to make the addresses available in Mail. See Import contacts.